Raymond Lotta: You Don't Know What You Think You "Know" About... 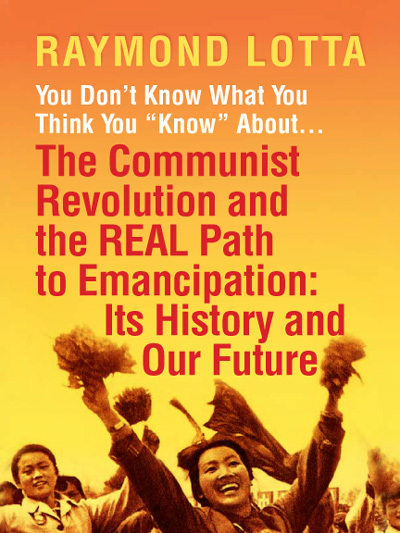 The Communist Revolution and the REAL Path to Emancipation: It's History and Our Future - Now Available as an Expanded eBook! Now Available as an Expanded eBook! Raymond Lotta’s research and argumentation, particularly about the Russian revolution and the Chinese Cultural Revolution, demonstrate forcefully once again that a better world for humanity is indeed possible. Anybody who does not want to witness the slow but sure destruction of our environment, and our humanity as well should find inspiration from Lotta’s book. Everything you “know” about the revolution is untrue. You need to surf the first wave and get on board for the next rising tide. Lotta offers a book that sets sail towards that horizon with unflinching commitment to the better future that we need.